Turkey is a big and respectively green country as opposed to what many people may think. It is between 35 and 42 long latitude, and 25 and 44 east longitude. Philadelphia, Tokyo and Beijing are some of the cities around the same latitude as Turkey. The total area Turkey covers is a bit less than 800.000 sq km ( 774,815 sq km ), which makes it one of the biggest countries in Europe and the Middle East. The neighbours are Greece and Bulgaria on the norhtwest,Armenia and Georgia on the northeast, Iran and Irak on the southeast and Syria on the south. Of all, the Turkish-Syrian border is the longest.Turkey has no direct border with Russia, but the Black Sea on the north.The other seas that cover Turkey are the Aegean on the west and the Mediterrenean on the south. In other words, Turkey is a huge big peninsula wrapped up by seas on three sides that looks like the head of a horse, as a Turkish poet has put it. The highest mountain of Turkey is the Mount Ararat in the east, on which Noah's Ark is believed to be ,and it is not far from the lake Van , the biggest lake of the country. Other known mountains are Mount Erciyes, Mount Hasan, Bursa Uludag ,and the mountainchain "The Tauruses". The Asian part of Anatolia comprises a large part of the present day Turkey, although the area mentioned above was only a small portion of the pre World War I. Once the Ottoman Empire had its widest borders from the Adriatic Sea to the Persian Gulf i.e. Indian Ocean. The eastern region of Turkey, Thrace, lies in Europe and has 23,000 sq km surface area. The elevation rises from west towards east and stabilizes at around 800m above sea level in the Central Anatolian Plateau. Further east, the elevation increases and reaches 2,000-2,200m on the average in eastern Anatolia. In the South, the taurus Mountains lay parallel to the Mediterranean with average elevations around 2,500m, sometimes reaching 4,OOOm above sea level. In Western Anatolia, the mountain ranges lie from east to west, perpendicular to the Aegean Sea creating fertile valleys and fields washed by the rivers of famous ancient times legends such as the Great Meander, Castros, Pactole and Selinus. These mountain ranges, perpendicular to the sea, created many peninsulas and bays and thus, a coastal line full of natural wonders. The high plateaus east of the sunken salt lake bowl contain many volcanoes with elevations of 3,000-4,OOOm and higher. The highest of these mountains is Mt. Ararat (5,165m). The largest lake in the country, Lake Van (3,600 sq km ) is also in this region. The high plains of Eastern Anatolia are generally large areas for animal husbandry, but there are lower, warmer and more fertile plains such as the Igdir plain. The rivers that originate in this region, like Euphrates and Tigris, flow south as the elevation decreases rapidly. 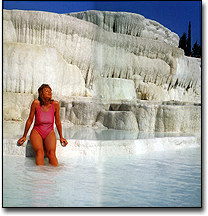 They water the South Eastern Anatolia region and, forming Upper Mesopotamia, they leave Turkey. In the Black Sea, it is noticeable that the mountains generally lie close to the sea. As a result of this, only several (Carsamba, Bafra, etc.) fertile plains were formed, and other than these plains, the mountains are almost perpendicular to the coastline. The region around the Marmara Sea, both in Anatolia and in Thrace has very few changes in elevation , and is comprised of large, flat, fertile lands. Copyright © 1995-2015 Turizm.net All rights reserved.